Do you know a child who needs help with math word problems? Some children need to be taught specific strategies that they can use to solve the problem. These are strategies that can be taught at home by parents/tutors or at school by teachers, assistants, etc. Research indicates that identifying keywords, pulling out relevant information, and creating visuals to represent math problems are effective methods for helping students truly comprehend word problems from the inside out. The use of multi-modal teaching strategies, which is an evidence-based practice in which the child is taught concepts through a variety of modes (e.g. hearing, seeing, touching), is recommended and suggested in this article as well. Many times children have trouble solving word problems because they do not know which operation (+, -, X, ÷) to use and they do not truly understand what the question is asking. When trying to figure out the correct operation, it is important to pay attention to keywords (clues to what the problem is asking you to do) and relevant information. Word problems often contain extra information that is not relevant to the problem. 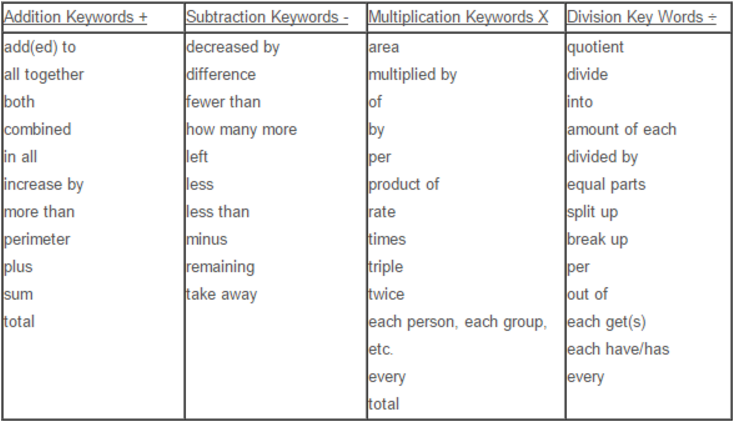 Below is a chart of keywords students can use to help them figure out what the problem is asking. You can print out this chart for your child or students and have him/her refer to it when trying to solve a word problem. Keep in mind that the chart above is just a guide and not a hard and fast rule for every single word problem. You will also sometimes find overlap with different operations such as “total” in addition and multiplication or “per” in multiplication and division. If your child is struggling to figure out what the question is asking after looking for key words and relevant information, encourage him to draw a picture of the problem as shown in the examples below. If the numbers are very high (above 15 or 20) it will be too cumbersome to draw the problem. In this case, the child can recreate the same problem with lower numbers and then draw the picture to figure out the operation needed to solve the problem. Once the child knows the correct operation, he can plug in the larger numbers. Drawing a picture of the problem gives children a way to see what the problem is actually asking. When they read the problem, the question may seem abstract or confusing to them because they can’t visualize the components of the question. Drawing a picture helps them clearly see what is going on in the problem and for many children makes it easier to solve. When working with your children or students, show them examples (such as one of the ones below) of how to underline keywords and relevant information, and how to draw their math problems. After you have shown the child a few examples, let them try to apply this strategy on their own to different problems. If they have difficulty finding the keywords, relevant information, or drawing the pictures, guide them through the process, giving them as much assistance as necessary. As their ability to use this strategy improves, gradually fade out your guidance. Once your child seems to really understand the problem, have him/her explain it back to you or teach it to you. When a person can explain a concept themselves, you know they truly understand it. The word problems below have the keywords and relevant information underlined. There is a corresponding picture to go with each problem. Tanya likes to go to the park and look at the clouds in the sky. 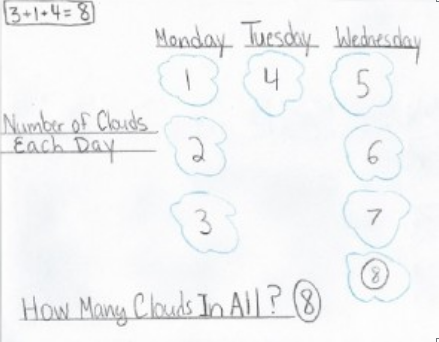 This week she saw 3 clouds on Monday, 1 cloud on Tuesday, and 4 clouds on Wednesday. How many clouds did she see in all? 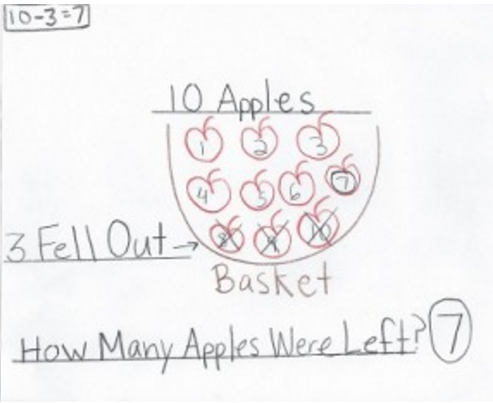 Jimmy picked 10 apples from a tree and put them in his basket. He didn’t know his basket had a hole in the bottom. 3 apples fell out on his way home. How many apples were left in Jimmy’s basket when he got home? David’s mom bought too much bottled water from the supermarket. David decided to give 2 bottles of water to each boy in his swim class. 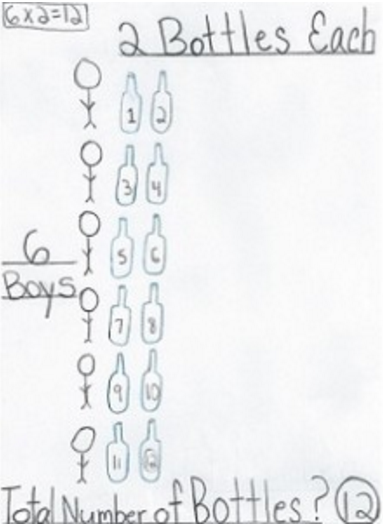 There were six boys in his swim class. What was the total number of bottles that David gave away? 3 very hungry girls wanted sandwiches at a picnic. There were 12 sandwiches at the picnic. The girls needed to split up the sandwiches, so that each girl got the same number of sandwiches. 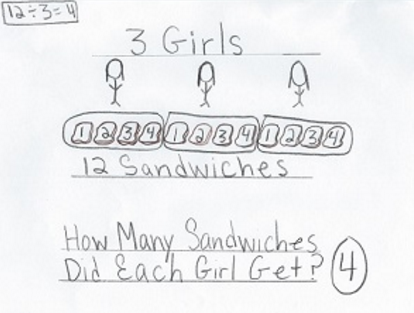 How many sandwiches did each girl get? If you want to make things even more concrete for the child you can try using real objects such as pieces or fruit, coins, or Math Manipulatives to represent the objects in the pictures. Some children do better when they can touch, move, and set up the objects that represent the problem. Keep in mind that every child is different. Some respond to several strategies, others respond to a few, while others may not respond to any strategies you try. 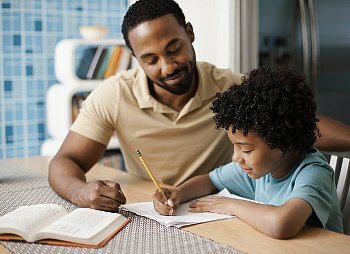 If your child is significantly struggling with math or acquiring other academic skills, despite consistent practice and guidance, talk to your child’s school and/or doctor. They should be able to refer you to the appropriate professionals to determine what might be interfering with your child’s progress and what additional strategies might help. Remember to always stay calm when working with a child or student, even if you think they should be getting something that they are not getting. If you get frustrated with them, they may start to feel anxious, angry, inferior, stupid, etc. which will lead to a less productive learning session. Keep sessions short (5 to 10 minutes for younger children or children who get easily frustrated and 10 to 15 minutes for older children or children who can work for longer periods without frustration), unless the child is eager to keep going. I also recommend reading 3 Ways to Use Timers to Encourage Homework and Chore Completion and How to Use Schedules to Improve Children’s Behavior for suggestions on how to encourage homework completion, especially when homework is taking a long time and the child is giving up, frustrated, rushing through the work, distracted, or refusing to complete the work. Thank you for visiting educationandbehavior.com. We provide free academic, behavioral, and social-emotional support for children. Browse our topics from the menu button at the top left of the page! Follow us on Facebook! Please share with parents and educators!